Headed off last Monday week, having decided to go up the East Coast. Lunch was at our usual stop, Rosedale, where we always buy one of the bakery’s famous pasties. Our first camp stop was at Stratford, just out of Sale. We stayed there for two days and found it to be very relaxing, with a view of the river. We visited the MacAlister River Park at Maffra, for a picnic lunch. We were very impressed with the park, which had been beautifully designed, with native plants, grasses, sculptures, a playground, picnic tables, toilets – the whole works. We just had time to eat our lunch, before the rain came down again. The daytime and night time temperatures varied from cold to very, very cold! 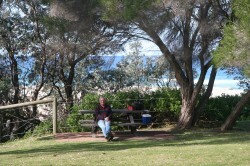 We drove on to Merimbula Lakes Caravan Park, having fish and chips at Cann River. 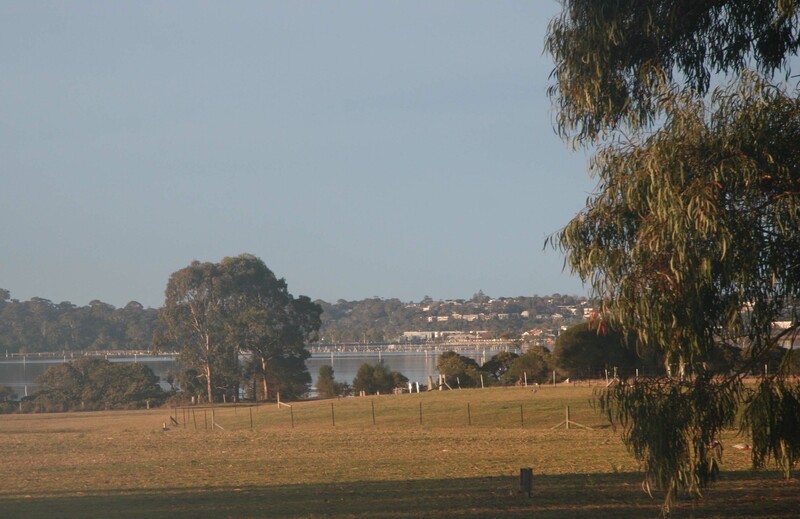 The Caravan Park had a view of the lakes in the distance, but was nothing to write home about (except that I am), hardly any trees, so we headed for both eucalypts and set up camp. We booked in for a week and on the 5th night we were hit with the Antarctic Vortex. We had had rain most days, but it was constant. It was freezing and the winds during the night were frightening, Russ had to roll in the awning in the dark and rain. The next day we moved camp across the road to a place without trees! When we were hitching up, the wind was so strong that I had to hang onto the stone guard of the van, so I didn’t lose my footing. 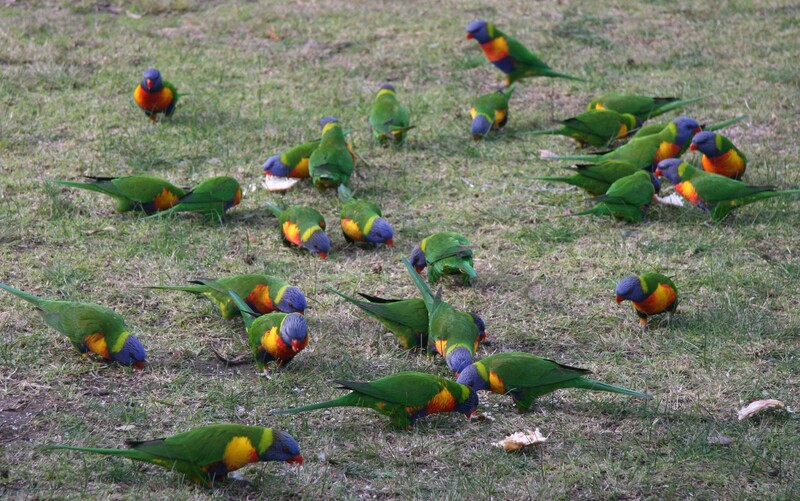 There were lots Lorikeets to brighten our day, another camper was feeding them every day. So we gave them some stale bread one day. We picnicked at Bournda National Park. 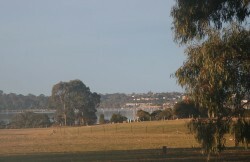 There wasn’t another camp or visitor there, which amazed us because it was the NSW school holidays. We thought it was as lovely, if not more so, than we remembered it to be. 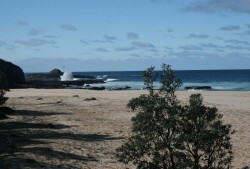 If the weather had been better, we would have camped there for sure. 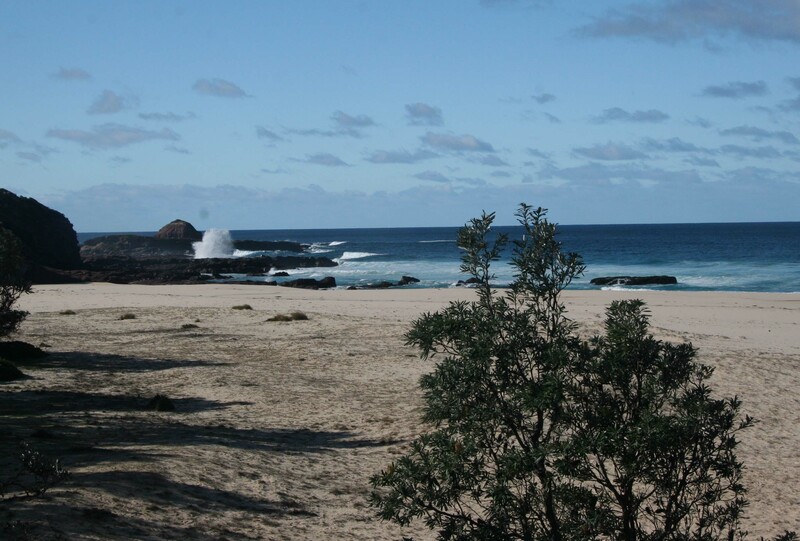 Another day, we visited Ben Boyd National Park and found a picturesque picnic area at Long Beach. It was absolutely beautiful. The area was quite sheltered and we didn’t want to leave. This was one day that we could enjoy some sunshine. 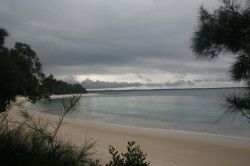 We moved further up the coast to Jervis Bay to Hidden Creek Caravan Park. It is very shady, but the owner told us that it is very sheltered. Hidden Creek, that borders the park, is more like a river, great for kayaking as it flows into Jervis Bay. Another plus is that we can use our OzPig, which we have enjoyed between showers. 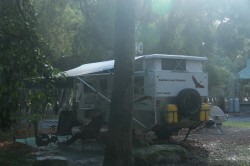 If you look carefully at the camp photo you can see me under the awning in front of the OzPig in the mist. The second low has moved in and it is raining again, so much so that the owner has had to spread wood-chips over the edges of our site and stones over the driveway and road to the loo, because of mud and puddles everywhere. We had constant rain overnight, between 2 and 3 inches we were told, and Russ had to fix a leak in the window over the bed, his side fortunately!! 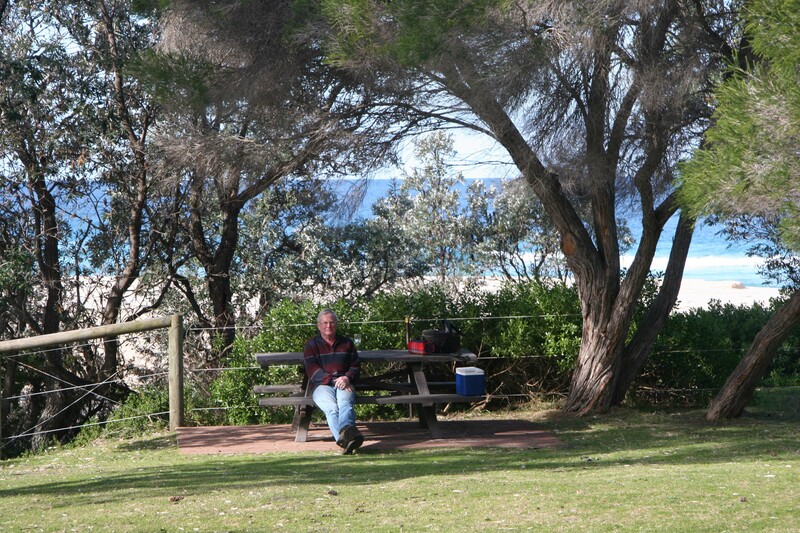 We found a lovely shelter for lunch a couple of days ago, at Moona Moona Creek Reserve. We had a BBQ and were able to stay there for an hour or so, until the cold sent us home again. I should mention that we have eaten 5 dozen oysters to date, sprinkled with tasty cheese and grilled. We have another dozen to go, then I think we’ll have to buy some more. Tough life, but someone’s got to do it! I don’t want you to think we’re having it too easy – we are having to open them ourselves. Not sure if you are away, but its Friday night and the Tour is on tv so I ‘m having a look to see if my winter travelogue is happening. Hope you’re well and I will check again later. Thanks for my b’day wishes, not sure if you got my reply as I have a Tablet now, and I don’t know what I’m doing at the moment with it, all too confusing for me. I’ve been meaning to call for several weeks now and just as I was about to ring, your email appeared. Great to hear you’re away but sorry that you’re getting wet. Still…..camping still beats working, even with rain! So you win. Hope you’re enjoying yourselves with that high aphrodisiac diet you’ve stumbled on to. Have fun and keep the reports coming. It’s really lovely to read of your adventures. I am intrigued by the OzPig? Well, it seems like you are getting British style weather. At least you’ve got an unending supply of oysters and good news about the cricket!